This week Apple released watchOS 4, the fourth major update to its flagship wearable device in the two years since it’s been available. While the Apple Watch had a fairly basic start with the first iteration of its operating system, Apple provided more frequent updates, with watchOS 2 redefining the experience and watchOS 3 significantly increasing performance and interactivity. With watchOS 3 having finally established a solid foundation for the wearable user experience, watchOS 4 seems to begin an era of more iterative improvements that refine, rather than redefine, the user interface. 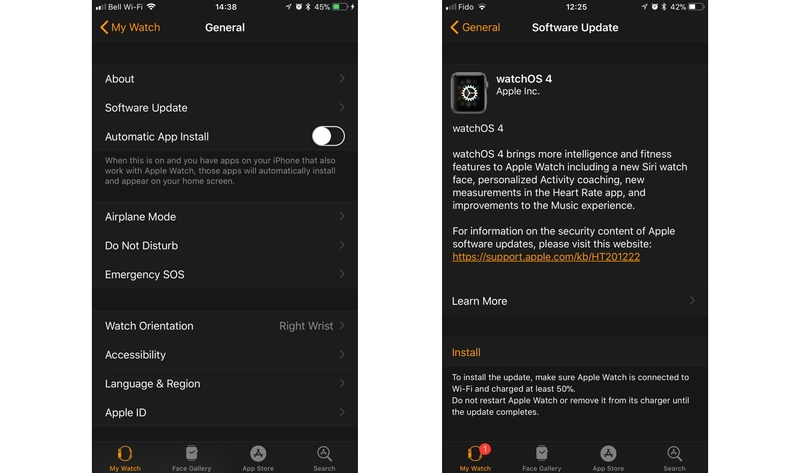 As with prior watchOS updates, you’ll need to start the update process from the Watch app on your iPhone, and you’ll need to already have iOS 11 installed to do so. You can check for new updates by opening the Watch app and choosing General, Software Update. The installation process will first download the update to the Apple Watch, and then — providing your Apple Watch has at least a 50 percent charge and is connected to power — proceed to install the update from there. Note that this one takes a while; in our experience it was about a 30 minute install, and some users have reported it taking even longer than that, likely depending on how busy Apple’s servers are. 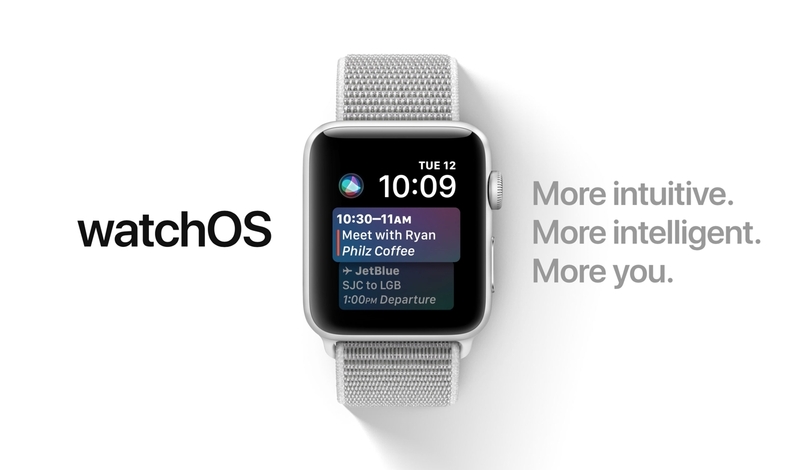 While watchOS 3 made some major changes to the Apple Watch user interface — introducing the Dock and Control Center and completely eliminating “glances” from the original design — watchOS 4 focuses more on adding polish in those areas. Everything remains where it was before, however Apple has redesigned the Dock with a vertical “stacked cards” style interface. Swiping to the left on an individual app in the Dock displays a “Remove” button that can be used to cast that app out of the Dock. Unlike before, where the Dock combined recently used and favourite apps, watchOS 4 also now requires you to choose one or the other from the Dock settings in the iPhone Watch app. Selecting “Recents” will include only those apps in the Dock that you’ve recently used, ordered by when they were last opened. “Favorites” lets you specify which apps are included in the Dock, in which case only the single most recently used app will be included at the top, with a “Keep in Dock” button below to allow you to add it permanently to the Dock right from your watch. Users who aren’t fans of the now-traditional app launcher on the Apple Watch will also appreciate that Apple has finally added an option to display your apps in a simple list view. This is accessed by pressing down on the app launcher screen and selecting “List View.” The Apple Watch will remember the last setting as your default, so if you prefer the list view, you can stick with it. Sadly, the list view is fixed to an alphabetical order with no visible way to customize it, although it will remain at the last-used position each time you return to it. A new “flashlight” option has also been added to the Control Center, which turns the watch face into an LED light, with three modes available — simple white light, a flashing white light, and a red light. No Apple Watch update would be complete without a selection of new Watch Faces, and this year’s release doesn’t disappoint. The Siri faces only offers two complication slots, one of which is used by default to trigger Siri, and customizability is limited to choosing which data sources will be included. Last year’s update gave us Mickey and Minnie Mouse, and with watchOS 4 this year, we get the cast from Toy Story. Four new faces are available, featuring Buzz Lightyear, Jessie, Woody, and all three as the main faces, which will change slightly each time you look at your watch, and are each also backed by a set of unique animations that can be accessed by tapping on the watch face. Unlike Mickey and Minnie, these don’t announce the time — or play any other sounds — but they’re cute and fun nonetheless, and add a bit of personality to your Apple Watch. The new kaleidoscope face leans more to the artistic side, allowing you to choose from one of seven photos — or your own custom photo — and three patterns to create a round kaleidoscope background behind an analog watch. Turning the Digital Crown will rotate through the kaleidoscope patterns. The Activity app has been enhanced to get a little bit more personal and proactive, with additional notifications that provide a bit more encouragement and coaching, and include full-screen “ring of fire” animations when you close your rings. New monthly challenges have also been added that are customized based on your previous activity levels, and can include things like setting a new daily average move goal or daily average exercise goal, rather than simply hitting set milestones. The Workout app has also gotten a nice redesign, with quick start “Open Goal” options for each workout type, and a menu button in the top-right corner to choose specific goals such as distance, calories, or time. Workout controls can now be accessed from a workout by swiping over to the screen on the left, and music controls can be found on the screen to the right of the main workout status display. On the Apple Watch Series 1 or later you can also now automatically start a synced playlist when beginning a workout. A new option under Do Not Disturb settings in the iPhone Watch app also allows you to automatically enable Do Not Disturb during your workouts, although unfortunately this cannot be customized based on workout type. watchOS 4 also adds a new High Intensity Interval Training (HIIT) workout mode, and updates Pool Swim workouts with auto sets to track distance for each stroke type and pace for each set. The Heart Rate app now includes visual graphs that chart your heart rate throughout the day, as well as your heart rate during workouts and walks, and recovery time. Users with an Apple Watch Series 1 or later also get a resting rate chart. A new option in the Notifications section of the iPhone Watch app lets you enable alerts if your heart rate suddenly rises to a user-specified threshold while you appear to have been inactive for ten minutes or more. The Health app on the iPhone also now tracks additional heart rate details, such as Heart Rate Variability (HRV) and VO2 Max. The Music app probably represents the most significant change in watchOS 4, with a complete redesign that basically takes it from what it was before — basically a combination of an iPod shuffle and iPhone remote — into a standalone Music app in its own right. You can now sync multiple playlists — as well as whole albums, artists, genres, and compilations — to your Apple Watch, and Apple Music subscribers can automatically add their curated playlists. Music syncs when the Apple Watch is charging, and is stored locally on the Apple Watch so it doesn’t need to be in range of your iPhone to listen to your music, although of course you’ll still need to use Bluetooth headphones with the Apple Watch. Unfortunately, with these advances the Music app also loses the ability to start music playback directly on your iPhone, so you’ll only be able to search for and play music that’s on your Apple Watch — although Apple Music subscribers will soon gain the ability to stream any content directly from Apple Music, that feature hasn’t yet been rolled out, and it’s unclear whether it will be limited to the new cellular-capable Apple Watch Series 3 or available on older Apple Watch models. Although the Apple Watch can’t directly access your iPhone’s music library, the “Now Playing” app still retains the ability to control music that’s already playing on your iPhone. 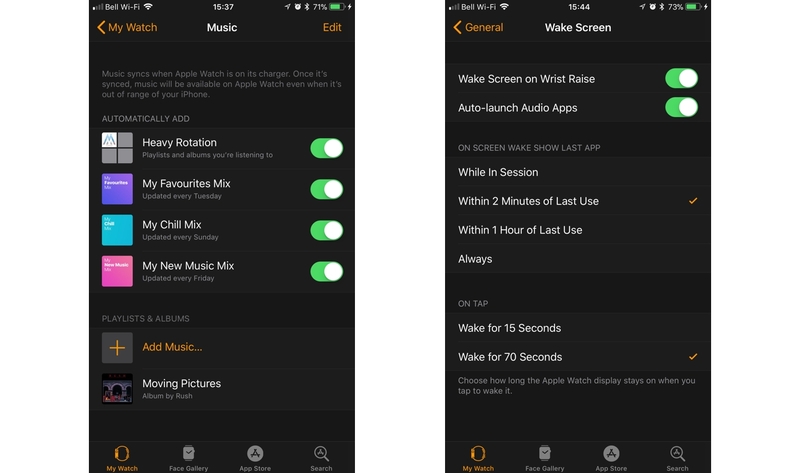 “Now Playing” will come up automatically by default on your watch whenever you begin playing anything from the iPhone Music app, however you can turn this off by going your iPhone Watch app and toggling off “Auto-launch Audio Apps” under General, Wake Screen. The Now Playing app can also always be found in the Dock whenever music is playing on your iPhone. The Mail app in watchOS 4 gains the ability to compose messages directly from your wrist. You can address messages by dictating a name to Siri or choosing one from your contacts, and fill in the subject and body using any of the usual watchOS data entry techniques — canned messages, Siri dictation, scribbles, or emoji. Additional left and right swipe gestures in the Mail app also provide options for trash, flag, and mark as unread. Sadly, like the macOS Mail app, these options are fixed rather than customizable as they are in iOS. Unlike last year’s watchOS 3 update, we wouldn’t say that watchOS 4 breathes new life into older Apple Watch models; it’s a mostly iterative update that adds some nice improvements to the experience, particularly for health and fitness users. It also makes the Apple Watch into a more usable portable music player. The good news, however, is that even if you’re still wearing an original first-generation Apple Watch, you’ll find that watchOS 4 still performs very well and offers a host of new benefits, with only a few relatively minor features limited to the newer models. While most users won’t find themselves in a rush to update to watchOS 4, we can’t find any reasons to avoid the update either. It’s a solid update regardless of which model of Apple Watch you own.